170 West is the newest addition to the Greenpoint waterfront. This boutique collection of 15 residences offers sweeping views of the East River and industrial chic design. 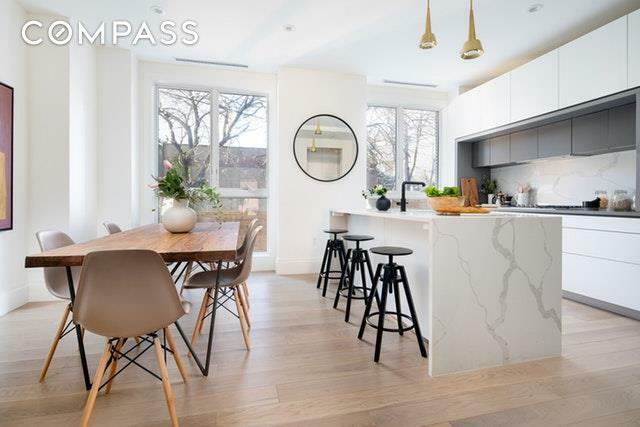 The exposed concrete ceilings are juxtaposed with sleek, custom kitchens, and refined, luxurious finishes throughout.Residence 101 is a convertible 2 or 3 bedroom garden duplex with over 1700 square feet spread over two floors plus an enormous private yard. 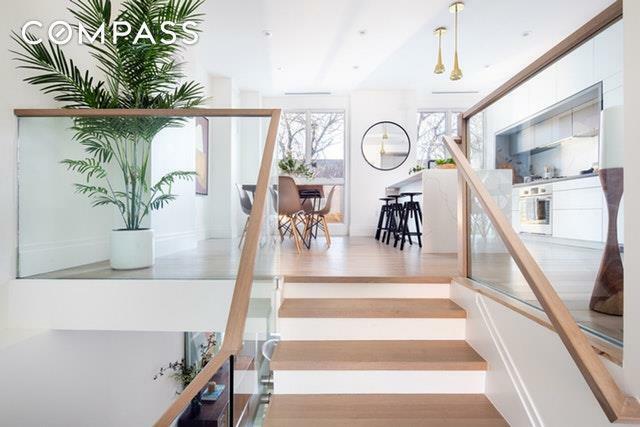 The split staircase leading either up to the kitchen and dining or down to the enormous flex space makes you feel like you are living in a house, not an apartment. Upstairs youll find the bright, open, kitchen and dining area. 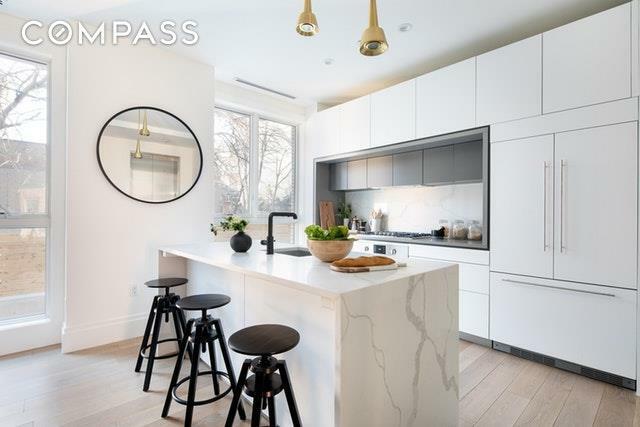 The well-appointed kitchen features a Caesarstone countertop and Ibiza white backsplash. The master bedroom has a large walk-in closet and a gorgeous ensuite bathroom with a double vanity, Calacatta backsplash, and chevron style heated floors.Downstairs is an enormous rec space offering tremendous flexibility. The 30-foot wide space boasts heated floors and includes a separate laundry room, huge closet, and a half bathroom. Large doors open to the incredibly rare two-tiered private garden. An outdoor space this large and this special is another reason this home lives more like a house than an apartment.170 West sits in the middle of the rapidly changing Greenpoint Waterfront. Just a short block from the ferry, you can enjoy a breezy commute to Manhattan (very good for the soul!). 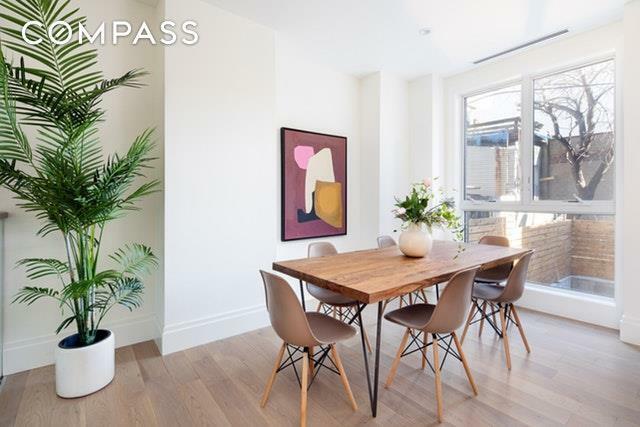 The building is also just one block from the shops and restaurants on Franklin Ave and just a short walk to the Greenpoint G train stop. Greenpoint offers a fantastic quality of living, blending waterfront light and views with a dynamic and diverse Brooklyn neighborhood vibe.